Peanut butter cookies are simply cookies that use peanut butter as one of the main ingredients. Peanut butter has been an American favorite ever since it was introduced to festival goers at the 1904 St. Louis World's fair. First touted as a health food, recipes using peanut butter began appearing in various cookbooks by the early 1900s. One of the earliest cookie recipes that listed peanuts as an ingredient was published by George Washington Carver, an African-American scientist, educator, botanist, and peanut advocate. His 1916 research bulletin, “How to Grow the Peanut and 105 Ways of Preparing in for Human Consumption,” called for crushed peanuts instead of the nut butter, however. Actual peanut butter itself didn't appear in a list of recipe ingredients until Ruth Wakefield, the inventor of chocolate chips, published her version of peanut butter cookies in the 1936 cookbook, Ruth Wakefield's Toll House Tried and True Recipes. It was around this time that the popularity of peanut butter cookies really took off. The classic criss-cross pattern makes peanut butter cookies instantly recognizable. However, nobody is really sure how this tradition started. Early recipes called for the cookie dough to be rolled into a ball and then flattened with the tines of a fork before baking. There are those who believe that this practice started because flattening the cookies in the middle makes them crispy instead of soggy. Others feel that pressing the dollop of dough with the tines of the fork assures the dough flattens properly and, therefore, bakes more evenly. Whatever the reason, the sweet and salty flavor combination of peanut butter cookies makes them delicious. 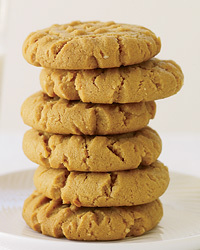 There is an ongoing friendly debate about whether smooth or crunchy peanut butter makes the best peanut butter cookies. Some food historians report that women and children prefer the smooth kind while the men go for the crunchy. Either way, peanut butter cookies are a popular dessert and after-school snack in homes across America. The best peanut butter cookies can now be made at home. They are yummy, filling and a great way to spend the afternoons. If you are looking for fun family activity, then take pleasure in baking peanut butter cookies. Baking peanut butter cookies from scratch isn't a difficult task, if you have all the ingredients in place. In a big bowl, mix the sugar and the peanut butter, into a smooth paste. In another bowl, beat the eggs till they are frothy. Add the baking soda and stir it well. Then add the vanilla extract. Add the peanut butter and sugar paste to the egg mixture, till it becomes one. Roll this dough into small balls of even size and press them onto greased cookie sheets at a distance of 2 inch from each other. To make a design on the cookie, take a fork and just pull it across. You will get a crisscross design. Bake the cookies for 8 to 10 minutes in the preheated oven. You will know that are baked, once they become fluffy and golden-brown. Let them cool on the sheet for 5 minutes and then remove them. Have these freshly baked peanut butter cookies with tea or just let your little kids relish them! Pour the butter and peanut butter in a large bowl and beat it well, until one. Add the plain sugar and the brown sugar in the mixture and beat it well. Now to the same mixture add an egg, milk and vanilla and beat it till the mixture becomes fluffy. Finally, add the flour, baking soda and salt in the mixture. Empty all of this in an air tight jar and refrigerate it for 4-8 hours. Once the dough is not greasy, remove it from the fridge and roll into even sized balls. Press these cookies onto the non-greased cookie sheet and let is bake for 5-8 minutes. Remove them immediately and presses the Hershey's Kisses on them. The chocolate might crack, but let the cookies cool down. As the cookie cools down, the chocolate will set in properly. To bake the best cookies, see to it that you have the right apparatus and the measuring units. Measure the ingredients properly to have the right taste for your cookies. The biggest mistake that first time bakers make, is that they take the ingredients by approximation. This messes up the entire procedure of baking. Keep an eye on the watch while baking. If you leave the oven unattended for a long time, it can have serious repercussions.